Environmental watering in the Macalister River in 2015–16 flushed waterholes and provided habitat for plants and animals, including platypus. Sightings of platypus in 2015–16 are an encouraging sign of the benefits of environmental watering. Fish surveys in 2015 found nine species of native fish: Australian smelt, flat-headed gudgeon, short- and long-finned eels, Australian bass and grayling, tupong, southern pygmy perch and common galaxia. 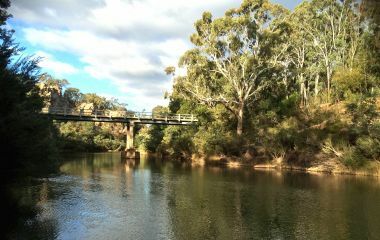 Australian grayling spawned in the lower Thomson River in response to combined flows from the Macalister and Thomson rivers. Despite these positive results, a blue-green algal bloom in the Macalister River was an unfortunate side effect of the warmer and drier conditions. This highlights the vulnerability of these systems in a warming climate and the importance of environmental watering in helping to protect and preserve these important riverine environments for the benefit of future generations. The improvements in the Macalister River have created a haven for local birdwatchers and wildlife enthusiasts. West Gippsland Catchment Management Authority has a community-based Environmental Water Advisory Group. Duncan Fraser, a member of the group, recently discovered a rare native damselfly species in the Bellbird Corner Reserve. Duncan is also a member of the Bellbird Corner Reserve Management Committee. "Damselflies are medium-to-large flying insects similar to dragonflies. They are often seen flying rapidly over water bodies. They need water to breed and can therefore be an important indicator of river health", Duncan said. 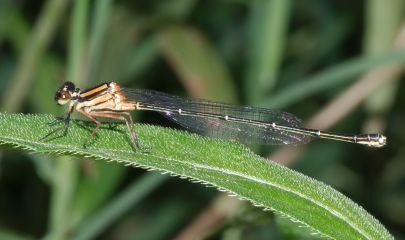 "The sighting of the rarely seen orange threadtail and bronze needle damselflies [below] was an exciting discovery."